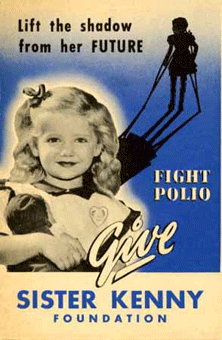 MINNEAPOLIS, MINN.--Because acute polio patients are very sick people who require regular care, in addition to the special techniques of the Kenny treatment, the Kenny Therapist is primarily a highly-skilled assistant to the physician. 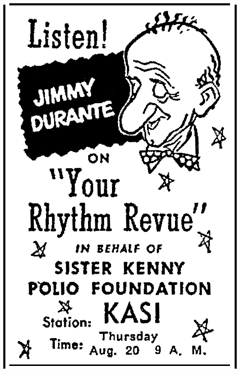 MINNEAPOLIS, MINN.--Radio, stage, screen and TV personalities supporting the 1954 nation-wide polio fund appeal of the Sister Elizabeth Kenny Foundation on a volunteer basis comprise a virtual "Who's Who in the Entertainment Field." Network(s): Several local affiliates and regional networks while in syndication. 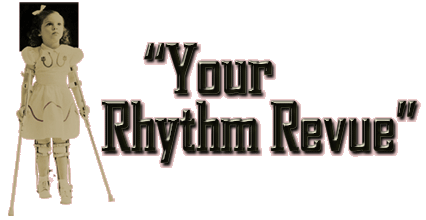 RadioGOLDINdex (Guest Star Time), RadioGOLDINdex (Your Rhythm Revue), Hickerson Guide. The most helpful provenances were the log of the radioGOLDINdex (Your Rhythm Revue) and newspaper listings.